This is a two part blog post is based off a great tutorial I read titled “Tutorial on Ground Loops” by P. M. Bellan. A link to the tutorial can be found at the end of the post. The subject of the two part post is something you won’t find in textbooks from your EE courses, spurious coupling mechanisms in circuits and test systems and how to prevent them. A spurious coupling mechanism is any outside unwanted voltage or current source entering a signal path. There are five main spurious coupling mechanisms: direct conduction, capacitive coupling, inductive coupling, radiated electromagnetic field pickup, and ground loops. This first post will focus on the first four types of spurious coupling and the second will focus strictly on ground loops. Direct conduction is caused when an unwanted conductive path is created between a circuit or signal path of interest and a neighboring signal path. This type of spurious coupling is shown in the figure below. The arrows in red represent the current from a neighboring signal entering the circuit of interest through an unwanted conductive path. The cause of this could be an un-insulated crossed wire, a shorted PCB run, sloppy solder job, or a malfunctioning switch in a test system. The only way to prevent it is to identify the low resistance path and correct it. Capacitive coupling, also known as stray capacitance, occurs due to the capacitance that exists between two otherwise isolated adjacent signal paths (see figure below). The current coupled from one signal path onto the other signal path can be represented by I = C * dv / dt. Where “I” is the unwanted current coupled into the signal path, “C” is the stray capacitance that exists between the adjacent signal paths, and “dv/dt” is the rate of change in voltage on the adjacent signal path. The closer the signal paths are together the higher the value of “C” is and therefore the higher the “I” value in the adjacent signal path. 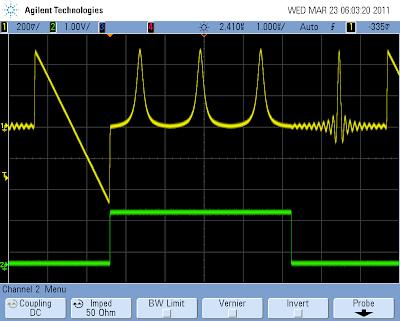 Also the larger the rate of change of the voltage (dv/dt) the higher the coupled “I” value in the adjacent signal path. Higher signal frequencies mean higher dv/dt. High impedance signal paths are especially vulnerable to this type of spurious coupling because they are low current already so any added current can have a big effect. In test systems capacitive coupling affects can be seen when using low frequency switch cards close or over their upper frequency limits. The same is true when using dense interface and bus connection types in test systems at their upper frequency limits. In these types of cases the capacitive coupling is often referred to as crosstalk. This capacitive coupling can be reduced by using shielded cable and connectors, larger spacing on PCB runs, and higher frequency rated switching products in your signal paths. Whenever current flows through a conductor it creates circular lines of magnetic flux (remember the Right Hand Rule). Any signal path adjacent to a current carrying signal path will have magnetic lines of flux coupled onto it creating a current flow in the signal path equivalent to the amount of linked flux lines that are in contact with it. This same principal is how transformers work. One way to reduce inductive coupling affects is to space out adjacent signal paths because the more space between the signal paths the weaker any linked magnetic flux lines will be. More practical ways include using twisted pair wiring or shielded cable. Twisted pair wiring essentially cancels out magnetic lines of flux by creating an alternating pattern where the magnetic flux lines oppose each other. Twisted pair wiring can be purchased or you can make it yourself. To make twisted pair take two wires of the same length. Secure one end of each wire in a vise and place the other ends inside a drill where the drill bit goes. Stretch the wires out, fire off the drill, and you have twisted pair. Shielded cable has a conductor as its outer shell which catches any flux lines created by the internal conductor essentially blocking them from coupling on adjacent signal paths. In today’s wireless world we are surrounded by transmitters. On top of that devices, such as electric motors, can act like transmitter even though that was not their design intention. These intentional and non-intentional transmitters fill every part of our environment with electromagnetic waves. Radiated electromagnetic field pickup is when your circuit or signal path acts like an antenna and picks up radiated electromagnetic waves. To get a first hand example of this kind of spurious coupling, place your mobile phone close to a stereo speaker (make sure the speaker is on). From there send a text message or some other data transmission and you will hear interference on the speaker created by the transmitted packets coming from the phone. The amount and frequency range of electromagnetic waves a circuit or signal path picks up depends on its length compared to the electromagnetic wave lengths in the area. For instance if your circuit or signal path is close to a transmitter that is operating at frequencies whose wavelengths are the same length, twice the length, or four times the length of your circuit or signal path the pickup will be much stronger. To reduce radiated electromagnetic field pickup use shielded cabling and conductive casing around any exposed signal paths. The idea is you want to create a Faraday Cage around your signal paths. 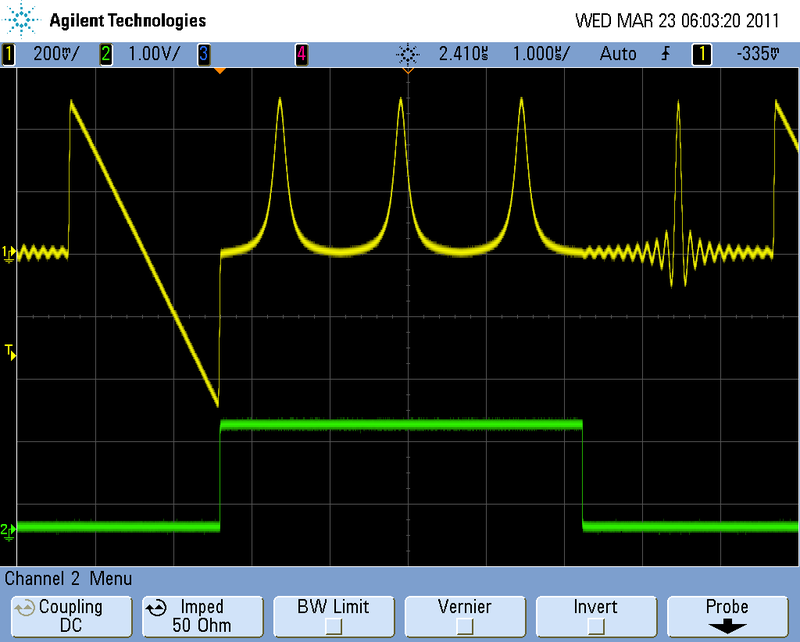 Click here to check out the "Tutorial on Ground Loops"
This blog post explains and demonstrates how to create an arbitrary waveform sequence with Agilent's 33522A or 33521A function arbitrary waveform generators. Waveform sequencing is the ability to seamlessly transition (no discontinuities in the output) from one waveform in memory to another waveform somewhere else in memory. Waveform sequencing allows you to create complex easily reconfigurable waveforms by pasting together other simpler waveforms in memory. It is analogous to creating a custom playlist on your MP3 player. Some example sequencing applications include generating serial protocols, simulating the output of environmental sensors over a wide range of conditions, or simulating a biomedical signal such as an ECG signal over a wide range of conditions. Currently there are two ways to create a arb waveform sequence: using SCPI commands or editing an existing sequence file (.seq file). I will cover both methods in this post. The example sequence we will create consists of three built-in arb waveforms so if you own a 33521A or a 33522A you have these waveforms on your instrument. The three waveforms used are: Negative Ramp, Lorentz, and Sinc. Lets start with the SCPI example. In the following SCPI example, all text preceded by "//" are comments explaining the command and are not part of the command (commands in blue). You can send these commands to the 3352xA either by putting them in your software code, using Agilent Connection Expert interactive IO feature, or using the interactive IO feature on the 3352xA's web interface. The following command creates our three waveform sequence. The "DATA:SEQ" part tells the 3352xA that this is a sequence command. The numbers "#3152" tell the 3352xA how long, in ASCII characters, the body of the sequence command is. In our example the "3" tells how long the character count number is ("1", "5", and "2" are three digits). The 152 tells the 3352xA that there are 152 characters in the body of the sequence command. "TESTseq" is the name of the sequence. Now your 3352xA should be outputting the TESTseq we just created. We still have one more step to go. The sequence is only in volatile memory so if you shut off or reset the 3352xA the sequence will be erased. The following command stores the sequence in internal non-volatile memory. Below is a scope screen shot of the sequence we just created. The waveform in green is the sync output of the 3352xA. Notice the Lorentz waveform is played three times and the sync output goes high at the start (point 10) of the Lorentz waveform. Ignore the first line "File Format: 1.10." The next four lines are the amplitude, sample rate, and filter setting for the sequence. This can all be modified if you wanted to change the settings of the sequence. The next line is the header for the waveforms and settings in the sequence. Notice the waveforms and settings are defined the same way they were in the SCPI example. You can modify the waveform names, settings, or add another waveform to create a whole new sequence. You could also copy and paste the sequence text above into a .txt file, modify it, and save it as a .seq file to create a new sequence without any SCPI commands. Whatever you name the .seq file will be the name of the sequence. From there just copy it from the USB memory stick to the 3352xA internal memory and you have a new sequence. In this post I am featuring a video a colleague of mine made showing how to control an instrument with LabVIEW using standard commands for programmable instrumentation (SCPI) directly. The SCPI is sent to the instrument via the virtual instrument software architecture (VISA), which is a I/O API for instruments. Why would you want to do this? This is what you would have to do if you wanted to control an instrument with LabView but the instrument does not have a LabView driver. Another advantage to programming with direct SCPI is it allows you to access all of the instruments low level more technical features that may be hidden from you in the driver. Enjoy! On 3/2/11 Agilent introduced the creme da la creme of arbitrary waveform generators (AWG) with the M8190A. The M8190A offers ultra wide bandwidth and high resolution -- simultaneously. The M8190A offers sampling rates up to 8 GS/s at 14-bits of resolution and 12 GS/s at 16-bits of resolution.